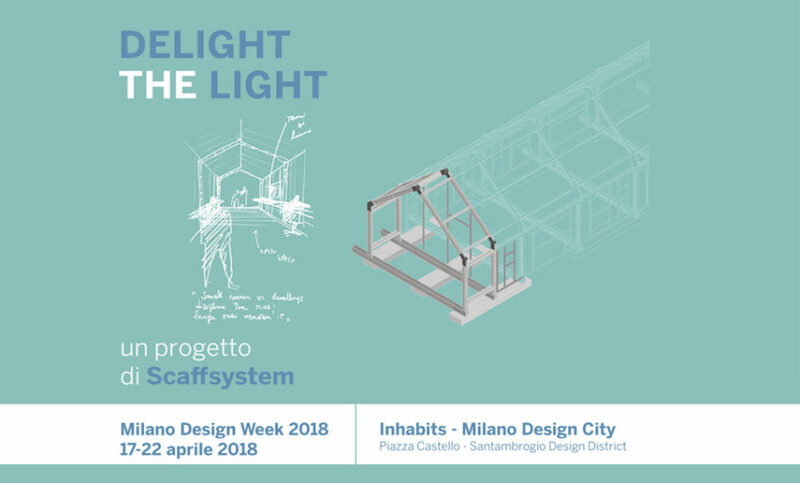 Scaffsystem is proud to announce its presence as main partner at Inhabits, the brand new exhibition dedicated to trends for future living during Milan Design Week from April 17-22, 2018. In this town always able to preview future tendencies and to speak the languages of design and innovation, our construction method called STRUCTURA has been selected to create “Delight the light“, a lounge for the media and International professionals based upon the use of a steel load-bearing structure. Within this special space, past, present and future trends of architecture will merge in a creative way, also thanks to a multicultural mood and an interesting variety of events planned to mark the occasion. Architects, engineers and designers will have the opportunity to share the most up-to-date best practices of sustainable design, while the press will be able to work, relax and discuss about Green Building state of the art and the latest technologies for energy efficiency. Afterwards, the structure will be donated to Polytechnic of Milan and moved to their Lecco branch, as a research team will analyse its thermal performances when combined with a variety of options for closed-panels framing and cladding, including dry systems for prefabricated houses. Scaffsystem’s modular solution for prefabricated housing, enriched by the stylish furniture items branded Officine Tamborrino, aims at inspiring all Green Building operators, as they will join the events to get updated about the latest housing units provided by companies and designers in compliance with the most advanced construction criteria to get sustainable, efficient and cost-effective solutions, with the value added of a customized architectural design. During the whole Milan Design Week, we will be delighted to welcome you at our booth and discuss your projects. E-mail us at info@scaffsystem.com to arrange a meeting and a free consultancy service.